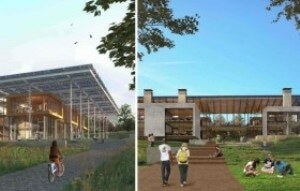 The Georgia Institute of Technology has selected the team of Lord Aeck Sargent and The Miller Hull Partnership to design the Institute’s Living Building Challenge 3.0 project. The final team was selected after three teams participated in an ideas competition to explore all the possibilities and challenges of designing this certified project, set to be constructed on the Georgia Tech campus beginning in 2017. Renderings created by Lord Aeck Sargent and The Miller Hull Partnership during the ideas competition, (left) the "porch scheme" with views to the Georgia Tech Eco-commons and (right) the "bridge scheme" spanning across a re-envisioned Dalney Street. The Living Building at Georgia Tech is a partnership between The Kendeda Fund and Georgia Tech to build what is expected to become the most environmentally advanced education and research building ever constructed in the Southeast. According to Wertheimer, the Living Building Challenge project will require a great deal of collaboration and the ability to embrace the process all the way through occupation and certification. Each of the three competing teams combined professionals from multiple disciplines including architecture and landscape architecture; mechanical, electrical, plumbing, civil and structural engineering; hydrology; sustainability; and other specialists and advisors. The concept of an ideas competition is new for Georgia Tech and quite appropriate, given the enormous task of planning a facility that not only performs to the highest of environmental standards but also addresses the needs of the occupants both in terms of health and their connection with each other and the natural surroundings. This initial discovery promotes community engagement and a learning process that accounts for climate, site evaluations, materials, cost to build and operate, accessibility and replicability for future generations. Over the course of the next few months, teams from Georgia Tech, Lord Aeck Sargent and Miller Hull – as well as representatives from The Kendeda Fund – will meet to analyze and discuss site evaluations, design considerations and technologies needed to achieve Living Building Challenge 3.0 certification. For more information, visit www.livingbuilding.gatech.edu.